Unanet, a developer of purpose-built project ERP software that helps project-driven organizations manage projects, people and financials in one integrated system, announces CEO and Founder, Fran Craig, has received a SmartCEO Brava Award in recognition of being a high-impact female business leader in the Greater Washington area. The SmartCEO Brava Awards Program is designed to honor women in large cities across the U.S. who exhibit exceptional leadership qualities. These women are either an Executive Director of a Nonprofit, a C-suite executive, or a CEO. Those who receive the award are irrepressible in their entrepreneurial spirit, have a passion for giving back to the community, and are exemplary leaders within their companies and communities. Local business leaders convene to determine each year’s winners based on these criteria along with their company growth and mentoring efforts. Fran’s strong connection with the Loudoun area and dedication to many philanthropic efforts earned her a Brava Award. She commits her time to not only creating a wonderful and thriving community in Unanet, but in the surrounding county, as well, specifically in the areas of STEM and women in business. Additionally, Fran mentors and speaks on entrepreneurship, women in technology, starting and operating small businesses, project management effectiveness, and how business management software can transform competitiveness. Not only does Fran promote these causes and dedicate time to these efforts, but she has created the same standard for community care in Unanet, as well. 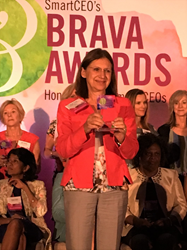 Unanet would also like to congratulate our customers who were honored with a Brava Award: Denise Garcia Van Wyngaardt of Indigo IT, Amy Wright of Macro Solutions, Amina Elgouacem of NEOSTEK, Inc., and Lisa Alferieff of TCG. Please visit https://www.smartceo.com/2016-washington-brava-fran-craig/ to learn more about Fran Craig and the SmartCEO Brava Awards Program.